Join the Office of Diversity, Inclusion, and Multicultural Education and Student Involvement for an evening with Rev. Jesse Jackson, founder and president of the Rainbow PUSH (People United to Save Humanity) Coalition. Rev. Jackson is an ordained Baptist minister who has been active on the national political stage for decades, serving in the U.S. Congress, twice running for the Democratic nomination for president, and continuing his life’s work as a civil rights leader and activist who worked alongside Martin Luther King, Jr. in the 1960s. 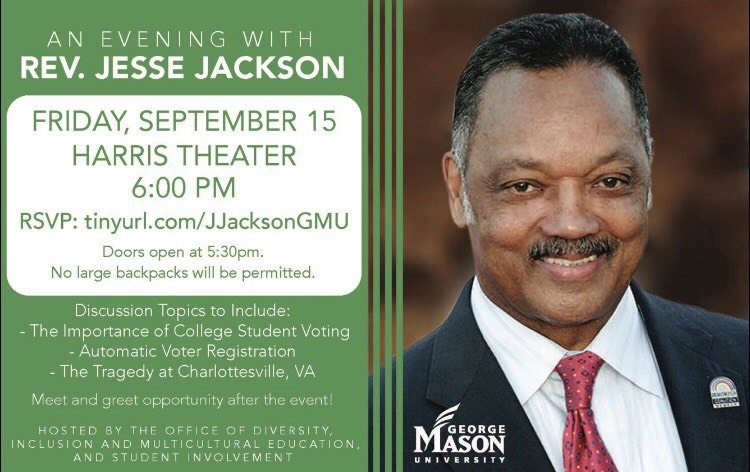 Discussion topics planned for the evening include student election participation, challenges with voter registration, and an examination of the events and aftermath of the recent tragedy in Charlottesville, VA. A meet and greet opportunity is planned following the event. Click here to RSVP and reserve your ticket to the event.